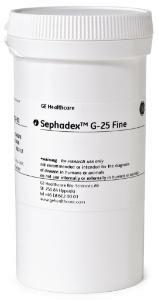 Sephadex™ G-25 is well established gel filtration medium for desalting and buffer exchange in industrial applications. Sephadex™ is a gel filtration resin prepared by crosslinking dextran with epichlorohydrin. Different types of Sephadex™ differ in their degree of cross-linking and hence in their degree of swelling and their molecular fractionation range. 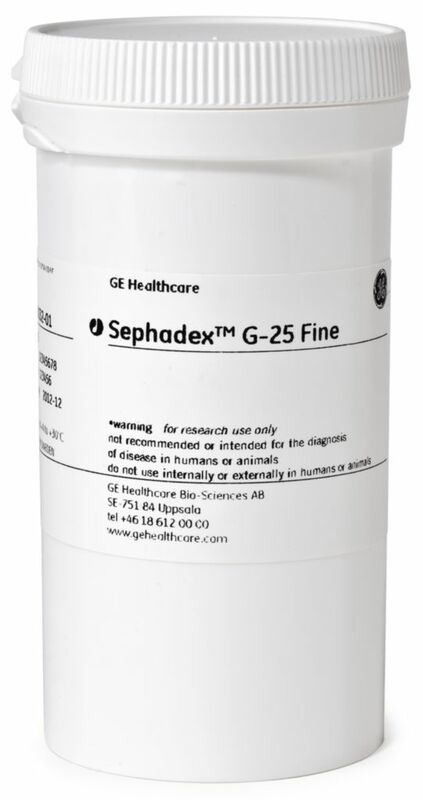 Sephadex™ G-25 is one of six different G-types ranging from G-10 for small molecules to G-100 for very large molecules. Sephadex™ G-25 is available in 4 different particle sizes (Coarse, Medium, Fine and Superfine). Superfine has the smallest bead size for higher efficiency with shorter diffusion distances. Coarse and Medium are preferred for large scale group separations where high flow rates and low operating pressures are required. Sephadex™ G-25 is also available in prepacked HiPrep™ desalting columns for fast and convenient desalting.